The Bourg Booklet Maker (BM-e) is C.P. Bourg’s high-end award winning booklet maker that utilizes the latest technology with unparalleled quality and speed to produce on-demand booklets. The paper flow follows a stitch–fold–trim process with guaranteed set integrity, a maximum of 120 pages per booklet (30 sheets) and a maximum speed of 5,000 booklets/hour – the best of its category. Large sheet sizes of 370 x 600 mm (14.57 x 23.62 in) can be processed through the BM-e with ease and create, for example, oversized B3 calendars formats and A4 (US letter) landscape booklets. To accommodate offset production needs, the BST-e collator can also be connected to the BM-e. 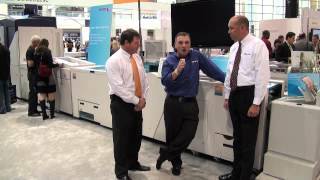 Within the BM-e, the paper-path can follow either a right to left process - and work In-Line with the HP Indigo 5500, 5600 and 7000 Series Digital presses - or a left to right process - and work In-Line with Xerox printers- offering a great flexibility! Furthermore, the color touchscreen interface (GUI) and the automated tool-less set-up capability makes the booklet maker very easy to use. 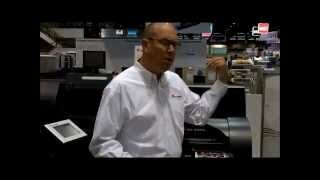 The BM-e responds to the needs of commercial printers and in-plant printing institutions that have shorter turnaround time, smaller job runs and tightening budgets. Final dimensions of booklets produced by the BM-e range from 70 x 119 mm (2.75 x 4.68 in) up to 300 mm x 370 mm (11.81 x 14.57 in) to a maximum speed of 5000 booklets/hour - the best of its category. The BM-e is able to stitch fold trim up to 30 sheets, stitches up to 55 sheets, and folds up to 120 pages booklets without marking, scuffing or scratching. The maximum trimming distance is 25 mm (0.98 in). Booklets produced can therefore be of an extremely small size. As the book press is integrated in the folder, booklets are systematically flatter and more aesthetically-pleasing. Like others C.P. Bourg booklet makers, the possibility of automatically measuring the thickness of each booklet in operation is a standard in our equipment. This enables you to have zero waste and increase your productivity. 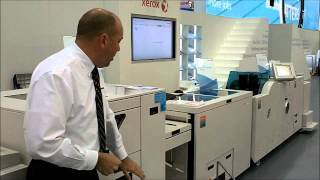 The BM-e is designed to be connected directly to a wide range of production digital printers/presses such as Xerox and HP Indigo but also to various C.P. Bourg products. The BM-e can work with the Bourg Sheet Feeder (BSF), which is designed to dramatically improve the efficiency of Near-Line production finishing for environments with on-demand printing, including collated digital variable data print (VDP) output. By being connected to the BSF, the BM-e also integrates the advantages of Off-Line and In-Line finishing, ideal for customers hesitating between Off-Line and In-Line finishing (see the description of the BSF). The BM-e also accepts sheet outputs from Bourg’s proven BST-e Suction Tower typically used with analog printers/presses. 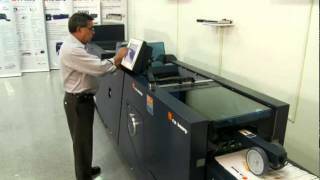 The Near-Line application BSF – BCM-e – BM-e is an ideal solution for digital printers/presses. Output from any engine (digital or pre-collated offset) can easily be placed into the Bourg Sheet Feeder (BSF). 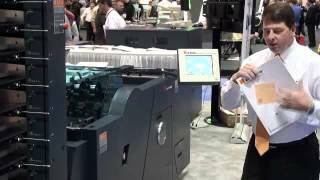 Through this solution, sheets will follow an automated bleed, crease, stitch, fold, trim process to create booklets of up to 120 pages (30 sheets). In brief, the BM-e uniquely integrates with your current and future workflow. C.P. Bourg's products can be equipped with two types of barcodes allowing you to achieve record breaking efficiency. 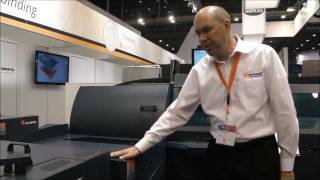 The imagePRESS C10000VP takes digital colour printing to the next level, combining exceptional quality, productivity and versatility at 100 ppm across a vast variety of applications. Highly innovative, high volume colour inkjet sheetfed presses that combines the proven inkjet advantages of high productivity with cut sheet versatility and media flexibility. Océ Varioprint 6000 series (1020 mm). Please contact us for more information. Océ Varioprint 6000 series (860 mm). Please contact us for more information. 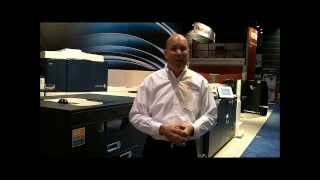 This In-Line Bourg booklet making solution with the Océ i300 digital press pays for itself within 2.5 years. Everything is more efficient. It takes us less time to get work out of the door and the end results look great. At the beginning of the digital era, we were probably a bit behind in investing, admits Thorne, adding: we didn’t want to buy a finishing unit on the back of a digital press, because we wanted something that was a little bit more independent, something we could use with our litho work. We thought when we bought the Boyurg Booklet Maker BM-e In-Line with the Bourg Suction Tower BST-e, when someone put a 5000-run job through, ‘hang on a minute, we can’t do this’ and we did it—now we’re up to 20,000 runs. We just do it, and it works. There’s been talk of buying another one. If we did, it would certainly be another C.P. Bourg. We wanted to increase our capacity. We had small machines from competing manufacturers In-Line and Off-Line. The volumes, settings, and capacities did not provide the required production speeds. The C.P. Bourg booklet-making equipment (BSF + BCM-e + BM-e + SQE) allows us to speed up our post-printing production. We've gained in speed (higher production capacity) and quality. The C.P. Bourg machines are really intuitive and easy to manage. We’ve also gained in productivity: we load the stacks of paper from the carts into the BSF sheet feeder. There’s no more manual work involved in producing brochures now. Everything’s automatic - it’s a great advantage. It means that we’ve doubled and nearly tripled our daily capacity. And this in turn means that our staff can work comfortably at a speed that wasn’t possible with the old equipment. Thanks to C.P. Bourg booklet-making (BSF + BCM-e + BM-e + SQE), all digitally-printed short runs are handled in house. 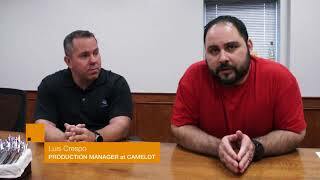 This guarantees that more work is done in house and all the files are managed upstream. So we ourselves deliver to the clients, which enables us to check the quality of the work done, and to make sure the clients are pleased with the result. In other words, the whole production process is controlled from start to finish. Our old booklet-maker from a competing manufacturer could only handle 3,000 or at most 5,000 booklets an hour. It was really holding back production. With the C.P. Bourg booklet-maker, we’ve taken a big step forward. This solution adapts to our production flow: this booklet-maker allows us to handle both digital and offset work, and even both together. This is why we also acquired collators. It means that we can produce the covers digitally with the inside done in offset. Result - a fine, square-edged booklet. This booklet-making solution gives us all the flexibility we need for our production method. We are delighted with it! Because the Bourg Sheet Feeder is so easy to load, our production capacity has been almost tripled. During the tender, we tested different solutions from competitor’s brands. The Bourg Booklet Making was the most adapted to our needs: the most productive solution, the fastest and the most intuitive which enables the operator to be more versatile. 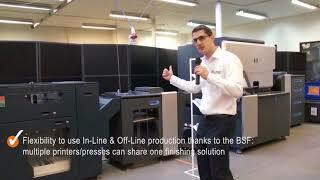 The Bourg Sheet Feeder (BSF) enables several presses to work with a single booklet making solution. We have a production capacity which suits to our digital presses. The Bourg Booklet Making solution BSF + BCM-e + BM-e + SQE offers numerous advantages: (1) This system is more intuitive and easier to use. Everything is programmed via the touchscreen. 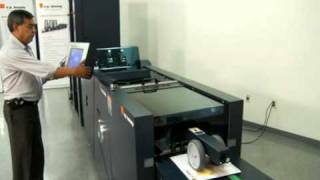 It is a solution which pleased printing agents. They became versatile on printing and finishing systems; (2) it uses less operator time: it frees them up time to concentrate on other tasks; (3) Before, with thicker books, we had to use hotmelt perfect binding or spiral binding. It was more expensive and took more time. Now, we offer precise and good quality stitched square back books; (4) We reduced by half the time taken for finishing which initially took three days. Delivery time has considerably been reduced. In addition, this Bourg booklet making system enables production of smaller formats, variable data and thicker books. With the traditional offset gathering lines, we could only do one print at a time. We had to wait for the end of the printing before collating. With the C.P. Bourg BSF In-Line with the C.P. Bourg BM-e, we produce on demand. The job is digitally printed, saddle-stitched, trimmed and packed. We have no loss of time. We doubled our production capacity. It’s awesome! As the alignment is extremely fast and accurate, the BM-e allows making 3-4 copies, as well as 10-12 000 or 20 000 copies of 1, 4 or up to 30 sheets. Another advantage is that the BM-e makes no scratching and no mark. When a famous cosmetics maker asks you to make a short-run of laminated brochures on a black gold paper, which costs a fortune per unit, you simply have no room for error. Finally, thanks to this booklet-making solution BSF + BM-e, we met two new demands: (1) The ability to produce of small newspapers in 30 minutes. It was impossible before. Our courier could not leave at 8 o’clock when we received the files at 7:30 a.m. Nowadays, we fill the motorbike trunk as we required. It is very quick. (2) The ability to produce car maintenance log books, which are 42 cm (16.53 in) long but only 10, 5 cm (4.13 in) high. It is the only booklet making module on the market which does that. Even in manual mode, the log books are quickly saddle-stitched. It gives us an advantage over the competition. We produce short-run magazines, mainly in runs from one to 500, both saddle-stitched on the BM-e bookletmaker, or as PUR-bound books on the BB3002-C. Both machines are foolproof and won’t let you do something that could potentially damage them. If you are looking for a short-run PUR binder you won’t go far wrong with this machine as well as the bookletmaker. In my opinion they are market leaders. Thanks to the Bourg Booklet Maker solution (i.e., BSF + BM-e + BCM-e) working In-Line with the Xerox iGen printer, Print Bound has dramatically cut the cost to produce a booklet. 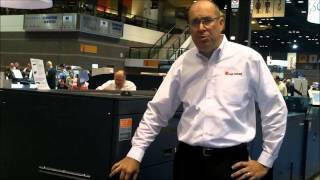 It eliminates make ready-time and printed paper waste to increase efficiency on short runs. Furthermore, printers can use Print Bound’s capabilities to produce the personalised brochures without investing in new kit they may only use occasionally. 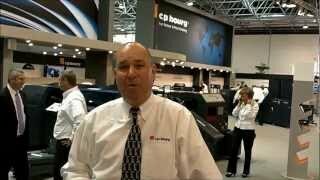 To complement the new Heidelberg Linoprint CP digital press (OEM’d version of the 130ppm Ricoh Pro C9110), Pensord has ordered a C.P. Bourg BB3002 PUR-C perfect binder, Bourg Sheet Feeder (BSF) with In-Line Bourg Bleed Crease Module (BCM-e) and Bourg Booklet Maker (BM-e), all supplied by UK agent Integra. "Again we looked at all the main players, but I just liked the build quality, engineering and simplicity of the Bourg machines, the compact adhesive system from Nordson on the binder was particularly impressive", said Karl Gater, Operations Director at £13m-turnover Pensord. We bought the Ferrari of digital printing (i.e., HP Indigo 5600 Digital Press) and finishing equipment (i.e., In-Line Bourg finishing equipments: BSF + BCM-e + BM-e + SQE) and it performs accordingly. Our new approach is bringing our entire business to the next level. With it, we’re winning additional work for our printing services and green screen technology segments and new contracts for Green Apple Studios. And if our volume grows higher than expected, we know the HP and Bourg equipment can handle it. Our booklets are much more exciting than loose-leaf portrait sell-sheets and they have a longer shelf life. They commonly end up on kitchen tables and coffee tables where they can inspire parents and grandparents to see the range of possibilities and place additional orders for prints, calendars and other products. 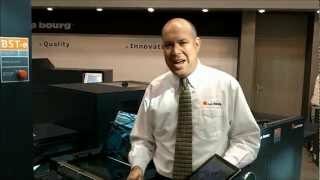 From an equipment standpoint, we had to learn a lot about digital printing and finishing in a short time. But HP and Bourg provided solid training and support. Plus their equipment’s ease of use and high level of automation also made for short learning curves, allowing us to come up to speed on digital production methods fairly quickly. 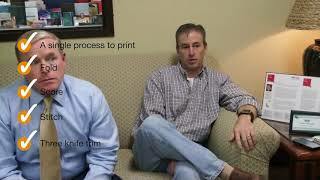 The only difference between finishing digital and offset print output, is that customers often want digital print jobs the same day – an issue that poses no problem for the BM-e. We can interrupt any job and save it in memory, start another job and have it finished and out the door in 30 minutes, and resume the first job all without a hitch. 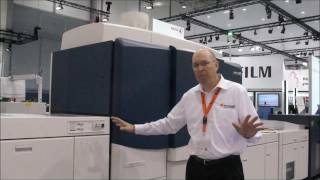 What is great about the Bourg BM-e, is that it combines the freedom of using largest format size available with more control and more automation. Now we’re able to bid on bigger and more complex jobs – including landscape-format booklets up to 120 pages 11-1/2” x 13-1/2 inches finished dimension. Thanks to the BM-e and the BST-e, now we can run a wider variety of jobs, including some we couldn’t run on our conventional 6-pocket finisher without getting the new folder. And the work the Bourg system produces is top-notch. I knew the Bourg BM-e and BST-e were going to be great, but they’re even better than I expected. They’ve allowed us to do more work than we anticipated or were planning on, and utilization has been very high right from the start. For invitations, we want the fold to be just right, so we use the BM-e to fold the stock, and to do a face trim. The BM-e usually applies just the right amount of pressure, and it allows us to adjust it as well. So the cards come out perfectly. At the end of the day, any job we don’t have to package and ship off to another bindery where we would be slotted into somebody else’s schedule, we save a customer and we make money. So we make sure we have the best tools for our employees to provide the services our customers want and need, and not just on time, but ahead of time. The new Bourg BM-e is worth the investment alone in the better control we get over the finishing process. Plus it opens new doors for our business, and once people are aware of what it can do, the financial ROI will follow. The pressman knows his equipment like the back of his hand, and the bindery operator has his own expertise. By keeping the two processes physically separate, the operators can collaborate, but no component gets in the way of the other. The presses can run at their full speed, the Bourg production line (BSF + BCM-e + BM-e) can run at its full speed and we have the freedom to take on a greater variety of work, including capacity overflow from other printers. Before we got the Bourg BSF line (BSF + BCM-e + BM-e), we would fold everything, gather it, put it on a handstitcher, and take it to a cutter for three-sided trimming. The BSF Sheet Feeder with the BCM-e module and BM-e Booklet Maker eliminates all that extra labor and time. And it's amazingly consistent. When a customer places an order at the ZenPrint website, it just blows through our system. 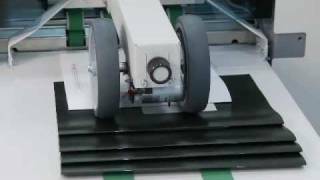 Because the entire line is so automated and operator-friendly, once the job is set up at the BM-e Booklet Maker and collated page sets and covers are brought to the sheet feeder on stacking carts, the operator can literally walk away and work on other tasks. There are other sheet feeders on the market, but nothing as automated, operator-friendly, as well made or designed to operate so seamlessly as the Bourg BSF line. Plus the work it produces just looks more solid – more professional – and the entire line has a smaller footprint, despite its larger sheet format. All in all, the Bourg BSF production line has just been awesome, and we couldn't be happier with C.P. Bourg.